This recipe is what could be called my “signature dish”. It has it appeared a couple of times in CAKE magazine because I had many requests for a repeat. I make them to give as presents and they are much appreciated. If giving them away I do use foil cases but that is optional if making them for yourself. I am using the mincemeat for which I gave you the recipe last month. You will need 2 x 12 hole patty tins, a large piping bag and large star nozzle, a 3”/8cm pastry cutter and foil cases if you like. Pastry: rub the butter into the flour and salt, stir in the sugar and mix with the egg and only enough water to make a firm dough. Rest it in the refrigerator for at least 15 minutes. Heat the oven to Gas 5 / 190 C. Place foil cases in the tins (if using them) or grease the tins. Topping: cream together the butter and the sugar until very soft, stir in the flour and ground almonds with the egg and almond extract. Roll out the pastry fairly thinly and line the cases. Mix together the mincemeat, cherries and brandy. Fill the pastry cases. Put a little of the topping into the piping bag. Pipe a ring around the edge of one tart, making sure the mincemeat shows well in the centre. The handle of a wooden spoon is useful to push the mixture into shape. NOTE: I find it best to pipe and bake only one at first to test the consistency of the mixture. If it is too stiff to pipe beat in a tbsp or so of milk, or if it is too soft add a little flour. Bake this trial one to check that it holds its shape. Pipe the remaining mixture on the tarts. 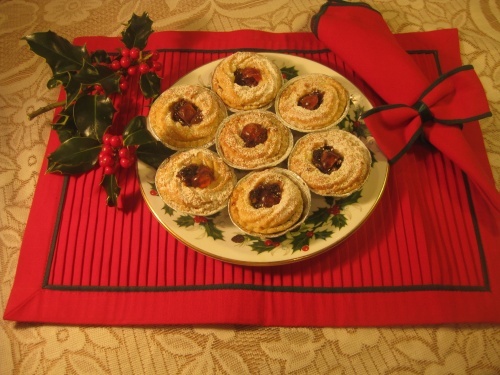 Bake for 20 minutes, remove from the oven and push the mixture into a good ring shape and add a little more mincemeat in the centre with a quarter of a cherry on top. Bake for a further 5 minutes or until golden brown. When they are cold, dredge with icing sugar. They will freeze well and can be warmed slightly when defrosted.